In June 2017, the Global Panel on Agriculture and Food Systems for Nutrition (GLOPAN), together with the Foundation for Community Development Mozambique and the Graça Machel Trust, held a series of three events focused on how government, civil society and the private sector might work together at the national, provincial and local level to develop scalable interventions to deliver high quality diets across Mozambique. The events took place in the broader context of the African Union’s Malabo Declaration, which calls for the pursuit of agriculture-led growth as a main strategy to achieve targets on food and nutrition security and shared prosperity,and the realisation of the Sustainable Development Goals which provide a powerful and enabling framework for action and change. Given the importance of consumer behaviour in determining diet quality, the Global Panel also launched its latest policy brief: Policy actions to support enhanced consumer behaviour for high-quality diets, with the support of Mrs Graça Machel, Founder and President of the Foundation for Community Development (FDC) and the Graça Machel Trust, and Global Panel member Her Excellency Rhoda Peace Tumusiime, and Former Commissioner for Rural Economy and Agriculture, African Union. The new brief provides evidence-based recommendations directed at both public and private sector actors in the food system to enhance consumer behaviour for improved nutrition. 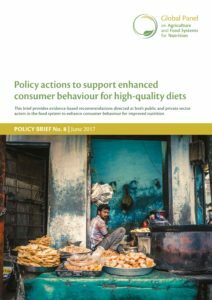 It examines policies that can lead to behaviour change and the consumption of healthier diets through understanding lifestyles, needs, barriers, motivators, influencers and triggers to change.